Gabriela Garcia knows how to tour this Hawaiian island like a cheapskate. The western Maui districts of Lahaina and Wailea, dominated by opulent resorts and golf courses, get all the honeymooners and wealthy tourists. Budget travelers will have better luck sticking to areas in the east. Kihei is a laid-back beach town. Upcountry Maui has ranches, small farms, old plantation general stores, and a vineyard. Paia, formerly the center of Hawaii’s sugar mill industry, attracted a hippie movement in the 1960s and is full of small shops and cafes selling natural foods, hemp products, and eclectic clothing. Hana can only be reached by a long, partially unpaved cliffside road, so it’s the least developed. 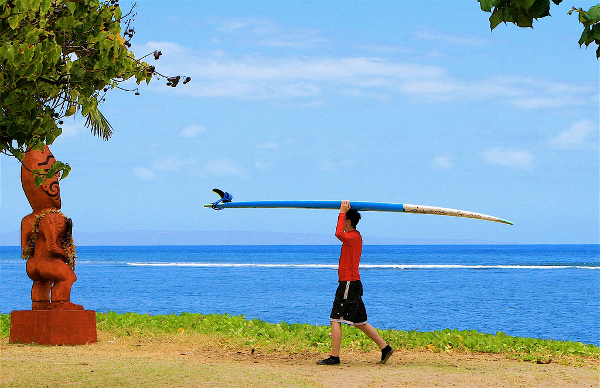 Maui has an abundance of budget hotels and hostels spread over the island. Since it’s a small piece of land, you’re never far from anywhere you might want to go. If you’re with a large enough group, even a condo can be budget, check out some of these prices at Maui Vacation Rentals. The bulletin board outside of Mana, a natural foods market in Paia, offers plenty of listings for rentals, sublets, and hostels. 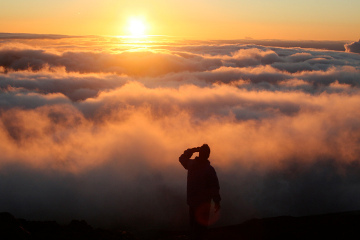 Backcountry camping inside the crater of the Haleakala Volcano is free. Lunchtime in Maui often finds me hiking in a forest or zigzagging in my jeep along some crazy cliffs, so picnics are the order of the day. You’ll find a lot of advertisements for pre-packed lunches along popular routes, but I find that with all the quality supermarkets, farmer’s markets, and fruit stands on the island, packing my own is easy and more cost-effective. Sansei Seafood Restaurant and Sushi Bar gives cheapies an opportunity to sample the island’s seafood on Mondays and Sundays, when everything is half off from 5:30-6PM and after 10PM. The Jawz fish taco truck is also popular with locals and is usually stationed outside of Big Beach, south of Wailea. Planning what to do on a budget in Maui is the easiest part. Mostly because nature is free. The road to Hana, a 68-mile ribbon of coastal highway, allows for stops along the way at waterfalls, Rainbow Eucalyptus trees, black sand beaches, and bamboo forests. La Perouse Bay is a stretch of black volcanic rock on the edge of turquoise sea, while the top of the Haleakala Volcano is a popular spot to watch the sun rise amongst the clouds. 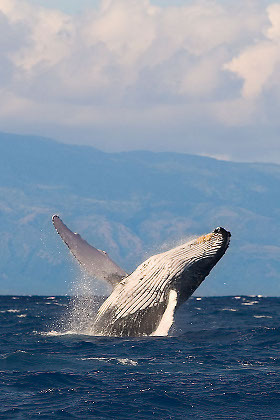 You can definitely skip the expensive whale watching boat excursions — during whale season I saw them from spots all over the island for free. For checking out some serious Hawaiian surfing, Peahi (Jaws) and Hookipa are the main spots. I’ll admit it — I’ve done a Luau. It involved dinner around a table with tourists rocking flowery button-ups and a dance dedicated to thanking American businessmen for everything gained from the takeover of the island. Seriously. I was more impressed with the spontaneous dancing at Little Beach in Makena. Every Sunday as the sun sets, locals form a drum circle with fire dancers. I had to hike barefoot over sharp rock in the dark to get over the cliff that leads to this stretch of clothing-optional beach, but if you arrive in the afternoon at Big Beach there are groups of people with torches that lead the way. Maui has buses to all main locations, with fares ranging from free to one dollar, but barely any run past 9PM. You’ll also see plenty of hitchhikers getting picked up. But I’ve found that a car really is the most convenient way to get around Maui, and pretty much the only way to drive the road to Hana without paying for an expensive private tour. I recommend skipping all of the brand-name car rental places at the airport in favor of Kihei Rent a Car, which has older models at discount rates. For more tips, try getting in touch with the Matador community’s destination expert on Hawaii, hawaiibren.